Christian boarding schools for at-risk teenage boys, as seen on the Hallmark movie, Safe Harbor. Therapeutic Christian boarding based in Florida. – faith-based boarding schools and boarding schools. Safe Harbor is a one-of-a-kind Christian boarding school designed to teach troubled boys valuable life skills and to build character. 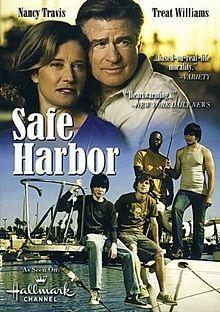 The story of the Safe Harbor Boarding School is portrayed in the 2009 movie “Safe Harbor” on the Hallmark Channel, which still airs periodically today. Safe Harbor has been featured nationally in People Magazine and on CBS This Morning, NBC News Today, CNN, and CBN. Safe Harbor is a Christian boarding school located in Jacksonville, Florida. Established in 1984, Safe Harbor has more than 25 years of experience in developing men of character, integrity, and vision. Safe Harbor uses a maritime setting to turn at-risk teenage boys into mature and capable young men. Boys who find help at Safe Harbor may be struggling with depression, anger, behavioral and school issues, minor drug use or trouble with the law, or the upheaval of a loss in their life. Often, young men like these need to see a broader view of the world, one not so focused on themselves or keeping up with their peers. Though you may be seeking other options besides Christian boarding schools with therapy, please consider that the Safe Harbor waterfront experience combined with the individual attention, counsel, and training make an unequaled setting for growth and change in behavior. Safe Harbor teaches maritime skills and seamanship while at the same time giving practical life skills, and character-building lessons while the boys also pursue their high school diplomas. The boys reside on board boats at this waterfront boarding school. They gain mastery in boating on the ocean and rivers while developing respect for self and others, self-reliance, perseverance, and much more. Each boy who graduates from Safe Harbor learns to captain his own vessel, both literally and figuratively. Teen boys living at Safe Harbor find stability and structure. We believe education goes on throughout life and that each teen learns differently. We arrange our academic program to handle different learning styles, which gives boys a chance for success. School is in session year-round, giving students a chance to catch up wherever they may have fallen behind academically. Boys who graduate Safe Harbor earn a high school diploma, and a lot of them continue their education at colleges of their choice. At Safe Harbor, practical knowledge means as much as academic knowledge. Besides all aspects of boating and seamanship, we provide vocational training in a variety of topics, including carpentry, boat care, navigation, log keeping and map reading, welding, engine repair, and basic electrical skills. We also know boys should be competent in basic life skills. Graduates of Safe Harbor boarding school are taught to balance a checkbook and handle checking and savings accounts responsibly, find employment using appropriate resume and interview skills, understand basic nutrition, and handle grocery shopping and cooking, to name just some of the topics we cover. Our goal is to make your boy respectful, self-reliant, confident, and competent. Safe Harbor teaches boys practical lessons based on the biblical book of Proverbs, and our overall methods are based on God’s Word. We encourage teens to ask the important questions about life and research the answers for themselves. Concerning Christian counseling, our program includes group and individual counseling, both from a mental health professional and from a pastoral counselor. The small number of boys in our program guarantees ample interaction time with professional staff and mentors. Because of the unique nature of the Christian boarding school, we enroll residents from all across the country. Safe Harbor is like no other boarding school or boys home and gives boys a transforming opportunity. As you continue your search for programs like Christian boarding schools, thank you for looking at Safe Harbor Academy situated on the East Coast in Jacksonville, Florida. To find out more, we invite you to explore the remainder of our Christian boarding school website, then fill out our online inquiry form or contact us directly at (904) 757-7918. Should you need help finding educational consultants, troubled teen boarding schools, teen boarding schools, schools troubled teens, please let us know. Safe Harbor is among the top therapeutic schools, our therapeutic boarding schools for boys; one of few residential treatment centers and residential schools for teens that is affordable. As a home for troubled boys it serves at-risk boys, we help boys in Florida, Georgia, in Kentucky, in Tennessee, in Missouri, in Louisiana, in Arkansas, and in Texas. Plus, in the Midwest in Michigan, in Ohio, in Indiana and in Illinois. Mostly, troubled teens from homes along the east coast including in Virginia, in North Carolina, in South Carolina, in Pennsylvania, in New Jersey, in Massachusetts and in New York are provided counseling and therapy. Christian boarding schools for at-risk teenage boys, as seen on the Hallmark movie, Safe Harbor. Therapeutic Christian boarding based in Florida.